The Coach House is Scottsdale's oldest tavern (est. 1959), and provides a pleasant, divey alternative to the other clubs in the area, with just the basics (I was advised not to try ordering any drink with more than two ingredients). It was unpleasantly packed on the Friday evening I dropped by during Spring Training and Spring Break, but I eventually managed to squeeze in to the bar for a drink and squeeze out for some air and enjoyable conversation. 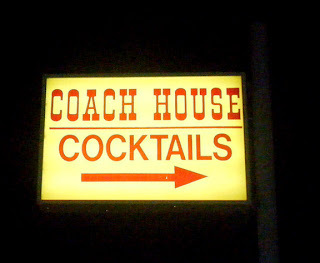 The Coach House also has a reputation for over-the-top Christmas lights during the holiday season (see image on their Facebook page).